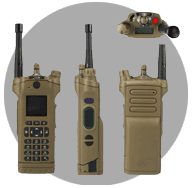 Five Star Wireless, Inc. designs, sells and provides customer support for Motorola wireless solutions. We offer our customers the highest quality of service and our employees are trained and knowledgeable in the ever-changing world of communications. As a Motorola Premier Channel Partner, Five Star Wireless can provide additional discounts on certain parts and services that we pass along to our customers; we offer specialized training; access to additional levels of technical support, as well as, dedicated customer support. As an authorized Federal MR and a Premier Resell Partner, we can provide our customers the option to buy direct from Motorola or through Five Star Wireless as a woman-owned small business. Regardless of the purchasing vehicle chosen, we will make sure that the resources are in place to support the customer’s mission critical communication requirements. Robert Joyner, Vice President of Five Star Wireless, has 30 years of experience working for Motorola, with the last 15 years in the Federal Government Division. In addition to his ownership and management role, he also serves as the Major Project Leader for five states throughout the Southeast. Robert is also responsible for account management throughout the panhandle of Florida and south Alabama. Carol Joyner is the President of this woman-owned small business and comes from a business management background; she was also a former employee with Motorola. Nick Todd is our Director of Sales and Business Development and works in south Alabama, Mississippi, Arkansas and south Tennessee. Let Five Star Wireless take command of your wireless solutions.